Wendell covered his mouth while he coughed and used his free hand to rub a clear spot in the foggy window. The snowflakes were whirling even harder, shrouding the backyard and highland pasture. Gray clouds topped Bald Mountain like clumps of unwashed wool. Earlier that morning, he’d laid out quilts and weighted the corners with rocks in hopes of saving the vegetables. He hated the notion of having to start the garden over. The quilts were now covered in snow. He warmed his hands over the kitchen-stove—the smell of eggs and ramps still wafting up from the grease-caked skillet—and pondered the whereabouts of his sheep. They were probably still on the Bald, and if it was flurrying here in the hollow, it was surely pouring on the high ridges. “Reckon I better go find them,” he said, lifting his voice so Gracie could hear. She was in the front room by the fireplace. He glanced at the dirty plates in the sink and coughed again. They’d just sheared the flock a few days ago, and Gracie had been so busy carding that morning—combing the wool back and forth into rolls thick enough to spin—she hadn’t seen how gloomy the clouds had gotten since breakfast. Not one had returned, though, and Wendell wondered if the queer weather had them confused. The flock was used to rushing back to the barn when snow fell in late October or early November. But they’d just been let loose for spring grazing. A big, late-season snow like this might’ve confounded what little sense the poor creatures had. “Sheep’s a jittery animal,” he said, speaking over the brushing and rubbing. Wendell didn’t bother to tell her he was leaving; there wasn’t time for arguing. He grabbed his coat from the peg and headed down the back-porch steps, screen-door flapping in the wind. He trudged up past the barn and through the pasture, watching flakes collect on the newly-greened grass and shrubs. It seemed a waste to have made it this far into spring, only to kill off the life that’d sprouted. He wondered what the Good Lord was thinking. Guess He don’t mind starting His garden over, Wendell mused as he stifled another pesky cough, but I do mind. As he climbed the trail through the woods, the wind picked up; the snow thickened, and he fretted over having forgotten his gloves. If Gracie hadn’t been so fussy, he thought, I wouldn’t have been in such a danged rush. For the last few months—ever since the boys, Harold and Daniel, had gone off to fight the Kaiser in the war to end all wars—Wendell had noticed a real pushy, pestering streak in Gracie, like it was her job to oversee all the chores now that they were the only able bodies around. But Wendell had decided to let her be. It was just her way of handling the worry. He figured his mama had done likewise while he was off fighting in South Dakota, and he could bear it until Harold and Daniel came home. Hopefully the Great War would end soon. It was 1918; they'd been gone for many months. He missed his boys and hoped they'd both come home in one piece—healthy and ready to get on with their lives. He prayed they'd return clear-headed, not racked with the kind of nervous spells and nightmares that still haunted him from his stint in the war. He heard a spattering of baahs and meehs which seemed to come from the mountaintop. Scurrying in that direction, he followed the narrow trail as it bent sharply around a rocky outcropping. There was more noise, closer this time, and then a low thumping sound. He couldn’t tell if it was from the wind bearing down on the trees or hooves clomping in the snow. Suddenly the sheep rushed around the bend, and Wendell lunged to get out of the way, losing his footing on the icy wayside, and tumbling down the mountain. When he looked up, everything Wendell put his eyes on was blurry and doubled, and the back of his head throbbed. A thin covering of snow slid from his backside when he rolled over and realized he was beside a chestnut tree. His fingertips were so numb he couldn’t feel the grooves of the bark, so he coiled his pale-purple hands into a ball and blew in some heat. Sitting up and gazing down the foggy mountainside, he padded the back of his achy head. Thank the Lord for the tree, he told himself. If he hadn’t rolled into the chestnut, no telling how far down the steep ridge he would’ve gone. Wendell climbed to his feet, and as his vision began to clear, realized he wasn’t but ten yards or so below the trail. 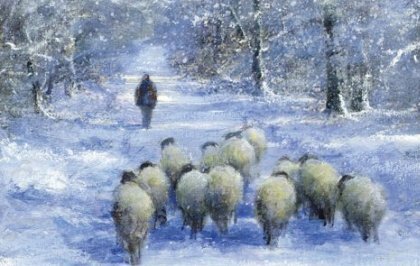 He trudged back up to the path, which, though shrouded with fresh snowflakes, was still dotted with tracks from the sheep. Probably back at the barn by now, he thought, studying the flow of the tiny hoof prints around his feet. Leaning against the jutting shelf of rocks, he caught his breath and wondered how long he’d been out. The sky was still pure gray, and the forest was shadowless, giving no clue as to the time. Rubbing the tender spot on his head, Wendell chuckled. Bum-rushed by my own flock. Gracie will get a kick out that. He pictured her with her fists on her hips, shaking her head: Told you they’d come back. You just didn’t want to do them dishes. A gust of wind raked the trees overhead and dumped snow on Wendell, and then, as the breeze and his rattling teeth settled, he heard a faint baah and meeh drifting down from the mountaintop. So one of his flock hadn’t made it home after all. Wendell shuffled around the rocky bend and gazed up the trail—which ascended the steep, snowy grade like a worn stairwell—and wondered if what he saw lying at the trail’s edge was actually there. It looked like a ram’s head placed upright in a pool of dark, crystallized blood. It was almost as if the thing were staring at him. He wondered for a moment if it was a rock, but, as he focused, the details sharpened, and there was no doubt. A ram’s severed head. The rest of the body was gone. He wandered up and crouched beside it, taking the ear-flap between his pale fingers and checking the under-bit and topnotch cuts he used to mark his flock. It was hisram—black eyes gazing at nothing in particular. What got you? Wendell thought, running his numb fingers across the scratches in the coiled, frosty horns. Then, off to the side of the trail, he noticed thin, dark-red splashes, which led to a bigger splotch several yards away. Beyond that he could see a thick trail of icy blood that disappeared into the gray trees. Running along in between were vague tracks, but here—where there were no rocks to provide cover—the wind and snow had made them difficult to identify. Nevertheless, images of what could’ve happened flashed into Wendell's head: snowflakes salting tawny fur, cloudy breaths pouring from between glistening fangs, claws like unsheathed knives—the panther swiping the ram’s throat and the head flying off, flinging blood as it tumbled onto the trail. He imagined the ram’s body collapsing like a felled tree, and then the big cat clamping the front flank between its fangs and dragging the headless corpse away. That must have been what terrified his flock and sent them barreling around the bend, knocking Wendell down as they fled. Couldn’t be a panther, though, he reminded himself, rubbing the sore spot on the back of his head. Growing up, he’d heard countless stories about mountain lions. But his pa claimed to have killed the last one in Concord County decades ago. Wendell had heard of sightings and livestock attacks since then, but he didn’t give the stories much credence. They were tall tales—the kind folks told their children by the fire to put a good scare in them. But what, besides a panther, could do this? Bobcats lacked the strength and size to kill a ram in such a brutal manner. No doubt a black bear could, but he'd never heard of a bear going after livestock. They mostly fed on leaves and bugs, and it was unlikely one would square off with an ornery ram, unless it was a mama protecting her cubs. Maybe Pa didn’t kill the last panther, after all. Regardless of the cause, they’d have to get a new ram now. There goes the wool money, he grumbled. The faint sounds came from up the trail, making him realize that one of his flock hadn’t made it home after all. Stupid animal, he thought. Panicked and ran the wrong damn way. Wendell wanted to go after the lost sheep, of course, but what if the thing—be it a panther, a desperate mama bear, or the biggest bobcat he could imagine—was still skulking through the foggy trees, waiting to pounce? He looked down the trail and considered heading home for a moment, but he just couldn’t stomach the idea of leaving one of his sheep behind. If only he’d brought his rifle, but he’d been in such a hurry earlier he’d forgotten it. Just like his gloves. Bet whatever did this is hiding the carcass of that ram. After all, only the head was left behind. He blew into his hands. The killer animal is probably in a cave somewhere, so it won’t come after me yet. I got time. Wendell hoofed it up the steep ascent, grabbing limbs and saplings whenever he needed leverage. He’d lost the stamina he’d once had—back when he could still beat his boys to the Bald—and soon a breathless, woozy spell took hold. He stopped and waited for it to pass, the thin, chilly air burning his nose. The snow was ankle-deep, shrouding the mountain ash and azaleas along the trail. Broadleaf trees had given way to firs and spruces and stubby beech trees, limbs sheathed in clumps of frozen fog. He looked down the ridge. On a clear day, he could’ve seen his farmhouse, but today, the clouds blocked out everything beyond the stunted growth around him. He recalled standing at the kitchen window earlier and gazing up at the cloudy spot where he now stood. He pictured Gracie standing there now, watching and shaking her head. She’s going to be sore at me, he thought. But I was right about the sheep. I was right. Wind blasted a long stream of snow across his backside, and as he pulled his coat tight and waited for the wind to calm, he heard the lone, lost sheep call out again. Poor critter’s up on the Bald, he figured, picturing it trembling among the shrubs or scrambling along one of the trails which looped around the mountaintop like a hastily coiled rope. Wendell followed the trail to where it started to level out, and then heard another round of baahs and meehs. But this time it sounded like it was coming from down the mountain. Thank the Lord, he thought. Poor thing’s finally heading home. Up ahead the trail forked around a moss-spotted boulder crowned with snow. A left turn would take him up to the Bald, a right hair-pinned back down the ridge towards home. Taking the right-hand trail, Wendell picked up the pace, and, before long, the trail curled around a clump of firs. When he rounded the bend and gazed ahead, his belly sank, arms dropping to his side like ice-laden branches. Before him was an open, tree-less stretch, blanketed in snow, rhododendron hedges zigzagging here and there. Now how’d you manage that? he wondered, glancing back. You took a right back there. Maybe the fog and snow had somehow confused me. With no trees for protection, the wind in the Bald was even colder, so he laced his quivering hands together and blew in as much heat as he could before shoving them back into his pockets. The sheep called out again, but this time, the cry sounded like it came from the Bald—not down the mountain like he’d thought before. How could it change direction so quickly? He shuffled along beside a hedge of rhododendrons—the plump bushes looking like ghosts in ragged sheets—and, in the blurry distance, thought he saw a man, sitting beside the trail—balled up tight, as if to keep himself warm. “Hey there, feller,” Wendell yelled, waving. The man didn’t seem to hear or see Wendell. Is that even a man? he wondered, narrowing his eyes on the fuzzy shape. Or is it a rock or something? The pouring snow swirled, so it was hard to be sure. He spun around and saw somebody standing beside the rhododendrons. The wind died down, and he could make out black pants and a long coat. The man looked old—face leathery and dark like an Indian’s. He wore a tall hat, crumpled on one side like a dinted can, and wiry strands of white hair fell over his shoulders. “He can’t find his stock,” the old man said, each dawdling word leaving his lips with a cold puff. The old man then ducked between two rhododendrons. Wendell shuffled over and angled his head between the bushes. The old man’s black coat was fading into the distance. Wendell glanced at the man by the trail. He wanted to talk to him—see if he’d seen his sheep. But if the old man’s account was correct, it probably was best to wait. The old man was about to disappear into the snowy shrubs, so Wendell slipped between the rhododendrons and followed him. Shelter and a fire sounded like the best thing right then. The old man curved back and forth through the narrow maze. The farther they went into the heart of the Bald, the higher the snow piled, coming up over Wendell’s boots, clumping in thick layers on the leaves, falling on his shoulders and head whenever they scooted through the path’s tighter passages. He couldn’t remember ever being so cold, so frozen he hardly felt it. The numbness bothered him; he feared what it might be hiding. If he came home all frostbit, Gracie would be sorer at him than she probably already was. If he lost some toes or a foot over this, what kind of man would he be then? He tried not to pay it any mind and focused on the trail instead. Soon they entered a clearing, circled by rhododendrons. Surely Wendell had been here before, but the swirling wind and heaps of snow made the patch unfamiliar. The old man took him to a little lean-to hut he’d erected with spruce limbs and covered with thick-needled fir branches. The ground beneath was clear, and a small fire smoked inside. Wendell was impressed—amazed actually—at the stranger’s craft, given the conditions. The old man sat beside a pile of wood and needles. He laid a couple of sticks—old, weathered ones which looked like chicken bones—across the little fire. He sprinkled some needles and blew. The needles sparked and smoked, throwing off a pleasant, orange glow. Wendell sat across from him and warmed his hands over the persistent little flames. “He’s not,” the old man said, eying the fire again. The old man laid more wood and needles on the fire and blew. The flickering light seemed to have a hold over him. “How’d you come to be up here?” Wendell asked. “That way,” the old man said, tilting his head eastward. Wendell’s body was thawing; he could feel his hands and feet again, but also the throb in the back of his skull. He rubbed it. “What’d you do to your head?” the old man asked. The old man lifted his eyebrows, as if to say, Try me. “Mountain lion?” Smith asked, glancing up. The old man said nothing. Apparently Smith preferred silence, just like Gracie did sometimes. On more than one occasion, she’d asked Wendell to stop prattling on all the time. But Gracie didn’t understand: talking was how he hushed and calmed his head. He still had nightmares about fighting the Injuns in South Dakota; sometimes, he had wide-awake flashes—frozen-faced men and the stiff, bullet-riddled bodies of women and children stretched out in the snow. Wendell hadn’t been there when it’d happened—hadn’t been party to the shooting spree—but he was part of the detachment that went back to Wounded Knee to dig the graves. He helped carve a long trench into the icy ground and toss in the bodies. Over twenty years had passed, but time had done little to wear down the memories. He could never find the comfort in silence that Gracie did. She could spin wool for hours without a peep as if the purr of the wheel were all the conversation she needed. Talking put Wendell out of his own head for a little while—talking about anything and everything, except for his time in the Army. So Wendell listened to the wind—how it pitched a fit, then hushed, only to get riled up again. His eyelids drooped, and he widened them, trying to stay pert. From across the fire, Smith’s dark skin looked so frail and papery a strong gust might peel it off. “You got a story or something?” Wendell asked, fighting off a yawn. The old man gazed at him. The old man gave him a confused squint, as crumpled as his hat. When Wendell awoke, the fire was just ash and a few thin curls of smoke. The old man was gone. Wendell called for him, but there was no reply, so he crawled out of the hut. The snow had let up considerably, but the sky was still pure gray. He finally spotted Smith beside a row of rhododendrons and walked over. Through a gap in the hedge, Smith was pointing to the valleys on the other side of Bald Mountain. The sky was cloudless, and the ridges stretched out like frozen waves, each one a lighter shade of blue. The land looked somehow purer than Wendell remembered, like it had when his pa had first brought him here—like he’d imagined it’d looked to his boys Harold and Daniel the first time he’d brought them here. It made him think of South Dakota—a few days before the massacre—when he’d looked out across a purple, grumbling sky and endless grassy plain and felt no bigger than a grain of sand next to the whole of God’s creation. “Looks like, like…” Wendell muttered and then stopped. It wasn’t something he could put into words. The old man drew his lips into an odd little smile that unnerved Wendell a little. Faint baahs and meehs came from the cloudy side of the bald, and Wendell bolted in the direction of the sound. He darted through the rhododendrons, following the faint remnants of the footsteps they’d made earlier, until he was back at the trail, catching his breath. Wendell turned. Smith was between the rhododendrons. “What?” Wendell asked, practically spitting the word. He was fed up with weird weather and odd-acting animals and strange people. He just wanted to go home. He grabbed its ear to show Smith the under-bit and topnotch cuts, but, when he got the ear between his fingers, he saw that the ewe hadn’t been marked. “It belongs to no man,” Smith said. When he stepped onto the trail, the ewe bucked and wiggled out of Wendell’s arms. It scampered away, disappearing into the cloudy trees. Wendell nodded anxiously but was still thinking, What kind of man don’t mark his sheep? When Smith placed his hand on Wendell’s shoulder, he smacked it away, as if it were a wasp. Smith stepped back and tilted his head. Something about the old man’s voice and eyes and leathery skin suddenly terrified Wendell. He took off down the trail, running until he was clear of the Bald and barreling through the woods again. He was going back to the big boulder—to the place where the path forked—except this time, he was going the other way, the right way. He didn’t even care about the sheep anymore. He just wanted to see Gracie—wanted to be by the fireplace, watching the spinning wheel and her ruddy cheeks as she wound the yarn. This image kept his legs churning through the dark woods—past all the crooked beech branches grabbing for him—kept him steady over all the slick patches where he nearly lost his footing—all the way back to the big, moss-speckled boulder. He leaned against the cold rock for a spell. It felt like the most solid thing on earth. Get going, ordered a voice in the back of his achy head, so he staggered to the fork and hunched, studying the diverging trails. Right one takes you down the mountain. Left one goes back to the Bald. Has to be. I just came down the left one. Wendell refused to look at him. He kept hobbling down the trail until his feet gave out, and he toppled into the snow. He dragged himself to the side of the trail and sat down. When a gust whipped sheets of snow across his body, he stretched the coat over his head. He wrapped his arms around his shins, pulled his thighs to his chest, and buried his face in the dark gap between his legs and his shirt. The breaths warmed the hollow spot enough to keep his teeth from chattering. He couldn’t feel his hands, though. It was as if they were no more a part of him than the rocks and trees. He cursed himself for leaving his gloves. Should’ve listened to Gracie. Should’ve washed those dishes. And then suddenly he knew. He turned and saw Smith standing on the trail a few feet away. “Is this another one of my spells?” Wendell asked. It’ll pass, Wendell assured himself, staying in denial. He continued to sit, balled up tight, burying his head in the space between his knees and his chest. At least in this little gap—warmed by his own breaths—he could picture the spokes of Gracie’s spinning wheel, ceaselessly purring in the orange flicker of the fireplace. Clumps of wool becoming long strands of fine yarn to be knitted into sweaters for Harold and Daniel when they returned from the war. Wendell lifted his head slightly and shifted his eyes down the trail. In the blurry distance, he thought he saw somebody standing near the rhododendrons, waving at him. Wendell couldn’t quite make out his face in the swirling snow, but his hands were bare. Apparently, he’d forgotten his gloves, too. “Hey over there! Hey, I’m talkin’ to you!” the man yelled. The familiar voice tore through Wendell like claws. A native of East Tennessee, Jason Reynolds now lives in the mountains of North Carolina with his wife, Jennifer, and their two beloved dogs, Charlie and Bowie. 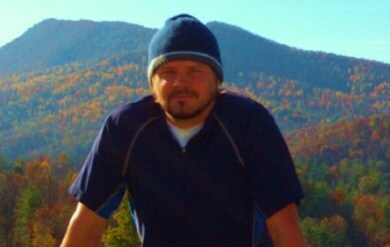 He is currently teaching English Composition at South College in Asheville. In his free time, he's usually hard at work on fiction pieces which blend the regional and dark fantasy genres in order to explore ecological and philosophical themes. His work has appeared in speculative fiction magazines such as ResAliens and Indigo Rising. Currently, he is revising and polishing his first novel, a philosophical take on the vampire mythos, which he hopes to get published next year.